Having a baby changes you in more ways than one. My body grew a living breathing human and then somehow I gave birth to said human. Obviously my body is going to change and although I miss my pre baby body, I'm having to get used to the fact I'm not getting it back. The day after I'd given birth I had my first real shower. The first actual shower was two hours after I had pushed the placenta and bits out of me, whilst squatting on a toilet, and a midwife had insisted that I took a shower in my birth suites wet room as I was covered in blood. I stood there, naked and shaking from the pure shock of what I had just done. With my mom hosing me down and helping me get the blood stains off my arms and legs. So my first real shower was at home, in my own shower. For the first time in a long time I was washing myself without feeling a bump, showering alone. I could put it down to the huge amount of hormones running through my body and the total lack of sleep. But I felt lonely, I wanted my baby back. The bond was broken and I was devastated. My tiger stripes, as I call them, give me all kinds of mixed feelings. One part of me is extremely proud of them, a kind of badge of honour for everything my body was able to do. But then again they cripple me with my lack of body confidence weighing down on me. I guess social media doesn't help, well when does it ever? I see all these skinny moms who are back to their pre pregnancy bodies two days postpartum and it makes me feel like a failure. Six months on and I'm struggling to get back into my old clothes. Never been one for body confidence though, I can't say I've ever been fully okay with myself. Over the past few years I've dealt with an eating disorder and constantly compare myself to every person I've ever met. Then again I've never been one to strut around the house in my underwear. The only time I was happy to be in my own skin was when I was pregnant, My body had a purpose, a superpower if you will. So I guess now that my baby is out I feel like the empty shell. The snail has moved out and I'm empty. My view on my body has changed since that first look in the shower. I can look at it with love, appreciation, pride maybe? But it's okay to not have total love for your body right? It's not perfect and it never will be. I've found peace in the knowledge i'll never be 100% with my body. I know they'll fade and ironically I'll probably miss them when they do. In the days after giving birth I was inundated with 'You look good', 'You look amazing for someone so soon into postpartum'. I felt slightly sick when people mentioned my body as I was keen to get my old one back as soon as possible. My bump had given my body a purpose and I wanted to go back to feeling 'normal' instead of the shell I was living in. I read a blog post by Hannah Gale about her postpartum body and she described it as 'Lindsey Lohan in Freaky Friday waking up and not recognising her body in the mirror', Which is perfect, exactly how I felt in the shower. Without my baby inside of me I felt like half a person. Strange how I'd done something so amazing yet felt like crap. Six months later and I'm getting used to the idea that 'This is me'. This is it for my body now. 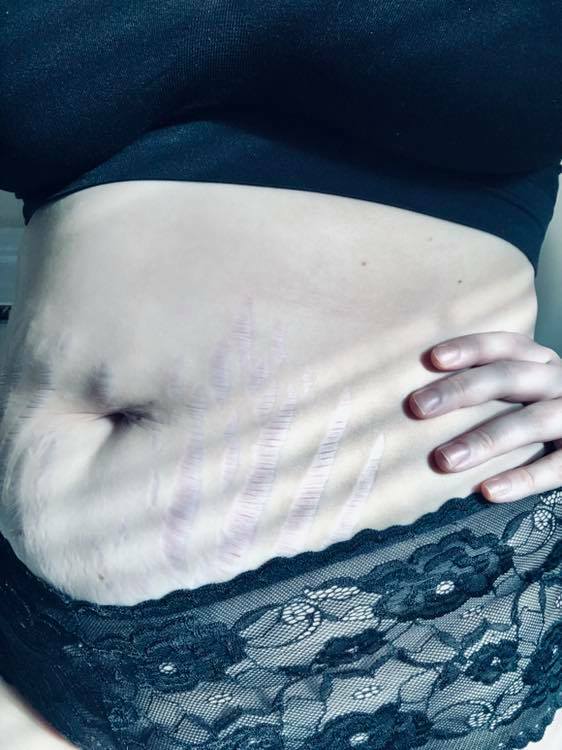 I feel like I owe everything to my body whilst slightly wishing my tiger marks weren't so big and my belly didn't sag so much. As much as I like to critique my body and make sinful remarks in my head about them, I do love them. You probably didn't get that impression reading this but I do love them. They are a little reminder of my baby, the time he spent living in my shell and the extraordinary things my body was able to do. This is such a brave post and you should be very proud of little Rupert! He is beautiful!